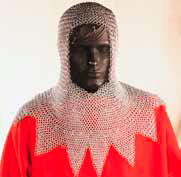 Chainmail is a form of armor composed of rings of metal linked together to become a flexible covering. This hood or coif is suitable for wearing on its own or under some helmets. Chainmail first appears historically around 300 BC. Many believe it was first invented by the Celtic peoples. Mail quickly spread through much of the world, including Europe, North Africa, the Middle East, and Asia. 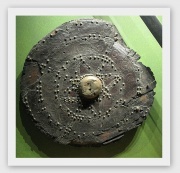 Many similar examples exist in museums and in artwork through the Middle Ages. This page was last modified on 16 November 2014, at 12:02.